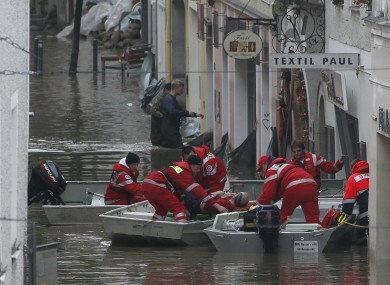 FLOODWATERS THAT HAVE killed at least 10 people across Europe have peaked in Prague and are now heading towards Germany, according to officials. “It’s peaking in Prague right now and by the evening the wave will get to Usti and Labem,” about 30 kilometres up the Elbe river from the German border, a spokesman for the Czech Hydrometeorogical Institute, told AFP. The floods have deluged the Czech capital’s historic centre, shuttering businesses and forcing a chaotic nighttime evacuation of the city’s zoo. Seven people have been killed so far in the country. Two others have died in Austria, and one in Switzerland. Germany has also been hit, with cities in the south and east on high alert as heavy floodwaters swell major rivers. “The last victim (in the Czech Republic) was a lady who was walking her dog in a park on Monday evening and who died under an eroded tree that fell on her,” a police spokesperson told AFP. Fire brigades had evacuated 8,340 people in the country as of early this morning. The heavy rainfall has triggered nightmarish memories of the 2002 floods that killed dozens in the region including 17 in the Czech Republic alone. Email “Floods peak in Czech Republic - Germany now on alert”. Feedback on “Floods peak in Czech Republic - Germany now on alert”.